The vessel shall be constructed as a high speed, sea kindly Whale Watching and Passenger service vessel. The Helm is raised and arranged to allow all round vision. Provision will be provided for storage of Oil Spill Response equipment, Fire Fighting equipment, etc..
Power Cummins QSL-9 x 2 (405 HP @ 2100 RPM) Gear Boxes ZF - 325-1 Propulsion Conventional Drives Speed (Cruising) 22 Knots (90% MCR) (Maximum) 24 Knots (Light Ship) ENGINEERING MAIN ENGINES AND GEARBOXES GENERAL Two (2) off freshwater heat exchange, sea water cooled, Cummins - model -QSL - 9 (405 HP @ 2100 RPM) or equivalent, medium continuous rating diesel engines shall be installed coupled to reverse / reduction marine, gearboxes as specified by engine suppliers. Alarms on main engine function (no shutdowns). The engines shall be fitted with an electric starter motor, crankshaft p. T. O. For steering pump. Water injected exhaust elbows. An auxiliary p. T. O. And bilge pump shall be fitted to one engine. Engines instrument panel and key stop / start to be provided for the main helm. Main engines to be resiliently mounted to ship's structure. Crank case breather shall be plumbed to above deck. Axial fans shall be fitted, 220 volt, in the machinery space for ventilation. Cummins QSL - 9 Series Engine Brochure as Below. An engine driven fire pump providing a constant 150 Kilo Pascals shall be fitted with 18 meters of hose with nozzle mounted on a hydrant adjacent to the wheel-house. Fire pumps shall be driven via an approved coupling / decoupling mechanism. Two (2) off portable CO2 fire extinguishers will be provided. Nine (9) off 9 litre foam extinguishers will be provided. Hinged aluminium spray arms shall be mounted on the bow of the vessel situated at 2.0 to 2.5 meters above water level. Spray coverage shall be 20 meters. Two (2) off dispersant tanks (7500 litres each) made as an integral part of the vessel with calibrated dip stick shall be supplied. Transfer of dispersant to be able to be done from forward to aft tanks via owners dispersant pump. The dispersant filling points and sullage shall be easily accessible and not subject to sea water egress. Air cooled two stage system (Carrier or equivalent) shall be installed with centre ducting fitted with dampers in saloon to ensure no cold spots occur 420 c to 20 / 240 c cooling efficiency. Ducting shall be insulated to ensure no that no condensation build up may occur. Heat exchangers in air-conditioning system shall have sacrificial zinc anodes fitted. Alternatively Split Air conditioning system can be installed. 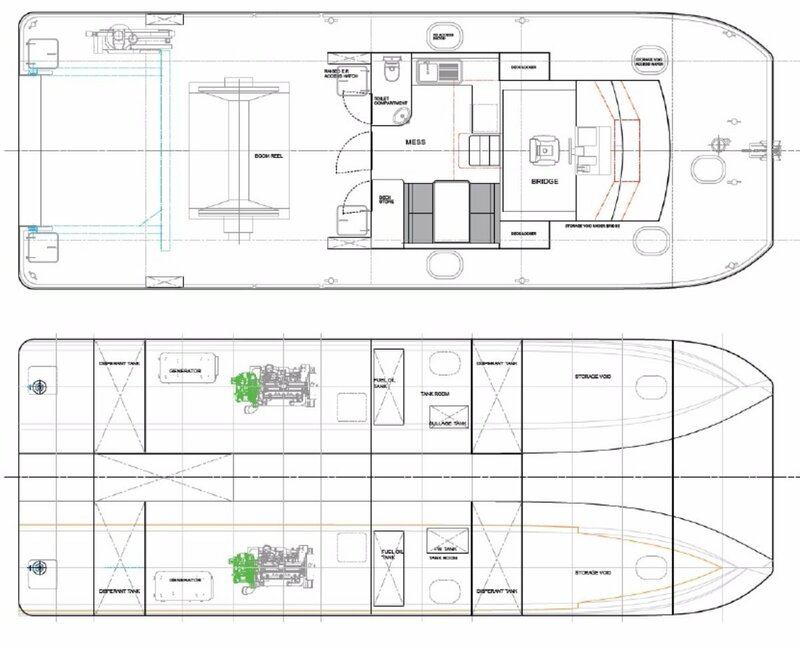 Two, Sole diesel - 17 GTC, 16.4 KVA 50 Hz, sea water cooled marine gen-set or equivalent shall be installed in compartment forward of engine room of Starboard and Port hull as recommended by the designer - Mark Ellis Marine Design. The FM-200® gaseous system uses a regulated greenhouse gas, under the Ozone Depleting Substances & Synthetic Greenhouse Gases (ODS & SGG) Management Regulations 1995. This gaseous system works in seconds and is readily suited to the protection of high value assets. The FM-200® provides total flood when used in; computer and electronic control rooms, telecommunication and switch rooms, data processing centres, vaults/tape storage, marine machinery spaces, chemical storage and clean rooms, medical laboratories and emergency power facilities. These agents are classified as suitable for use in occupied areas and are considered to have no ozone depleting potential (ODP). The systems are designed in accordance with AS 4214-2002 Gaseous fire extinguishing systems, parts 1 and 2. The gearboxes shall be connected to 316 stainless steel propeller shafts (3") supported in heavy walled brass stern tube and water lubricated bearings. Stern tube glands shall be provided. Manganese bronze, balanced 4 blade propellers shall be fitted. Semi balanced rudders constructed of stainless steel with a stainless steel stock shall be provided. Cast bronze tillers shall be fitted to the stocks and actuated by double acting hydraulic rams. Two (2) off 1500 litres aluminium fuel tank shall be provided and installed. Fuel tank vents shall terminate above deck level. Duplex fuel filters, Raycor or similar, to be fitted to main engines. Approved flexible hoses to be used for all engine connections. Tank level instruments to be installed (sight tube), to be actuated by weight valve. Fuel drain valves and inspection hatches shall be installed. Emergency shut off valves remote operated shall be installed. The electrical power shall be supplied from four lead acid batteries located in an enclosure in the machinery space. Battery selection will be via a Colhersee or similar rotary selection switch mounted adjacent to the batteries. To supply and fit a FASSI - F100 22 hydraulic crane or equivalent with hydraulic pump supply and winch installed includes manual extension. Oil spill response equipment shall be provided and provision for installation allowed for by the Builder. Provision to move easily the 400 mm boom mounted reels forward and aft for better weight distribution whilst travelling and required position for deployment (1000 mm. Increments for locating boom assembly shall be provided). Three (3) off 400 meter VIKOMA inflatable boom and reels or similar shall be provided. All fasteners throughout the vessel shall be of 316 grade stainless steel with nylon insulators utilised where dissimilar metals, as required. To supply and fit trolling valves to each main engine gearbox. 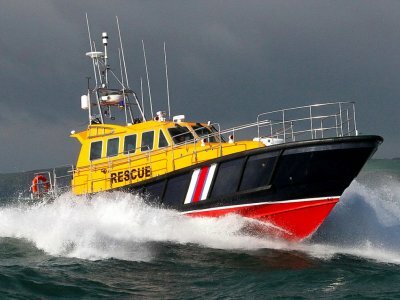 The valve would allow the engine to operate at a higher speed than would be required for the vessel speed (actually slip clutch) and give much greater flexibility for operation and manoeuvring. 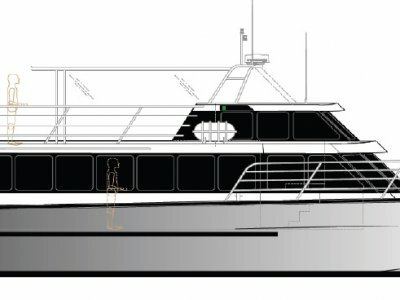 The vessel shall be constructed as a high speed, sea kindly Whale Watching and Passenger service vessel. The Helm is raised and arranged to allow all round vision. Provision will be provided for storage of Oil Spill Response equipment, Fire Fighting equipment, etc.. The vessels hull shall be moulded in GRP, transversely framed and longitudinally stiffened with scantlings in accordance with the Indian Register of Shipping (IRS) an IACS member, for GRP planing craft, under Certification of the IRS or equivalent. Four (4) watertight bulkheads shall be provided for watertight subdivision in each hull. Limber holes to be provided as necessary to ensure proper drainage and ventilation of all tanks, compartments, pockets and voids. Insert blocks shall be used for all local structural reinforcement as required. Additional stiffening shall be applied above the propellers and ample tip clearance shall be provided. The bow and stern quarters shall be additionally stiffened internally. 85 dba. Shall be the desired sound level within the main deck cabin area. All materials used shall be in accordance with the Standards approved by the IRS. - Watertight soft patches over engine bays. - Watertight access hatches fitted to engine rooms. - Weather tight door fitted to cabin aft bulkhead. - Weather tight anchor locker in bow. - Watertight hatches (flush) to steering compartments. 1. Eight off aluminium mooring bollards at each corner of the vessel (Twin pillar style). Towing Bollards shall be located at rear of cabin structure (panama style) in the bulwarks. 3. One set aluminium rails as shown. 5. 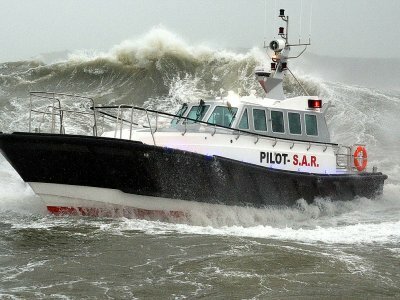 Removable guard rails on both sides of vessel. Capstan shall be fitted at the stern, starboard side (2 tonnes capacity). Above winch shall be hydraulically actuated. 7. 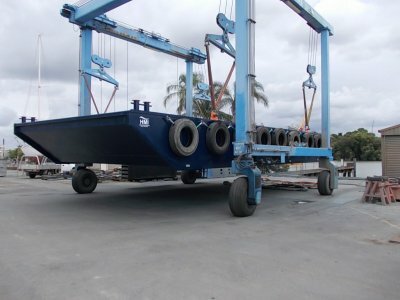 Underfloor storage with watertight flush hatches shall be provided for storage boom anchors, rope and connectors. The vessel's hull and superstructure shall have a FRP high gloss finish. The side, aft and foredeck shall be provided with a non-skid paint finish. All underwater areas shall be anti-fouled and provided with sacrificial anodes as required. Flexible fender sections 1.00 Meter long shall be recessed into the vessels sides, bow and stern quarters. These shall be located at the agreed height from the main deck level. The vessels bulwarks shall be strengthened to support the recessed fenders. Fenders diameter shall be approximately 450 mm. Praga Marine Private Limited offers to install into the starboard bow a hydraulic bowthruster of approximately 35 HP capacity. Praga Marine Private Limited offers to make provision for Retro fitting of a bowthruster whereby structure in the starboard hull shall be designed to fit unit at a later date. For two (2) weeks training on the vessel, covering all aspects of the vessel and equipment operation routine maintenance and Oil spill equipment training. Maintenance manuals, operation manuals are provided with the vessel and normal commissioning trails are included with the price. The Vessel/s shall be constructed in accordance to the relevant Class under Survey and Certification of the Indian Register of Shipping (IRS) an IACS member classification society. In the event that there should exist any conflict, inconsistencies or contradictions or there should be any doubt regarding the interpretation between the Plans and Specifications, the Specifications shall prevail and govern. Likewise in event of inconsistencies or contradictions between Plans or the Specifications and the Agreement, the provisions of the Agreement shall prevail and govern.